Checkdam completly filled with rain water. 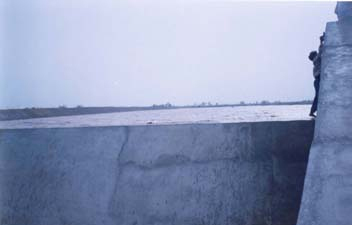 The main and significant solution lies in conserving each and every drop of rain water during the monsoon period by constructing suitable water conservation structures in these regions and diverting the surface water, which otherwise merges with seas in the form of run off into those structures. Obviously the most viable water conservation structure in these areas are check dams, which are capable of collecting and conserving ther precious water resources and at the same time help in replenishing and recharging the ground water in the wells existing in the adjacent areas. Check dams are designed to cope with the flow of the water in the rivers and are constructed of height of 1.5 to 2.0 m. Wells and tube wells in the surrounding s are benifited because of the enhanced ground water recharge. The storage of these checkdams varies between 0.015Mm to 0.035Mm.